Arbutus is a broadleaf evergreen tree that can reach 6-30 meters in height. The bark is chartreuse and smooth, and as the tree ages the bark turns a deep brown-red color and peels off. It often grows with many stems extending from a central base and has the appearance of a shrub. 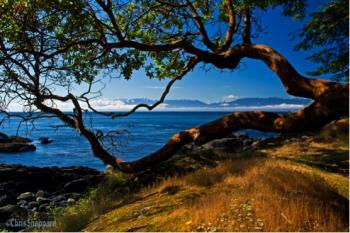 (2) The arbutus leaves are evergreen, meaning they retain their leaves throughout the year. During the summer, the areas of the bark which are exposed to the sun peel off to reveal a younger green bark underneath. As the bark ages, it will turn golden. (3) The leaves can range from egg-shaped to elliptic, grow 5-15 cm long in length with a dark shiny surface above and a whiter green on the underside. The flowers of arbutus appear in large drooping clusters shaped like little urns. The flowers range in color from white to pink and smell like honey. The fruit of the arbutus are berries which are round in shape and range in color from orange to red. 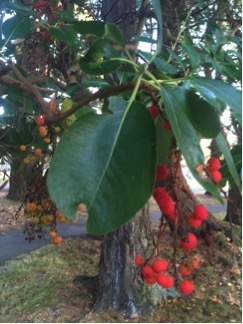 The berries are edible but are not often eaten due to their bland taste. UVic Campus Location(s): It can be found in a variety of places on campus, but it tends to be found in sites that are less groomed and more natural. It can be found specifically in the following areas: Finnerty Ravine, Haro Creek, Mystic Vale, Hobbs Creek and Bowker Creek. Figure 1: Image used with permission from artist. Figures 2 and 3 taken by Carrie Booth, November 2017. Native Plant PNW. Pacific Madrone, Arbutus menziesii. 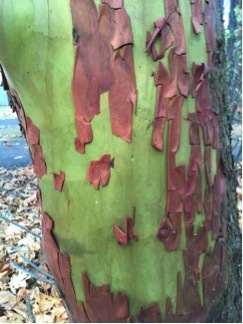 Retrieved from http://nativeplantspnw.com/pacific-madrone-arbutus-menziesii/ on November 7, 2017. Harrop-Archibald, H. (2007) University of Victoria Natural Features Study: Bowker Creek, Cunningham Woods, Upper Hobbs Creek/Mystic Vale. Restoration of Natural Systems Program. Parish, R., 1948, Thomson, S. M. 1., Coward, G., Canadian Forest Service, Canada-British Columbia Partnership Agreement on Forest Resource Development: FRDA II, & British Columbia. Ministry of Forests. (1994). Tree book: Learning to recognize trees of british columbia (2nd ed.). Victoria, B.C: Ministry of Forests. Horne, J. (2012). WSANEC: Emerging land or emerging people. University of Victoria.